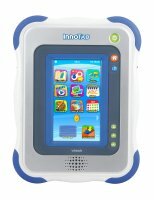 Similar in size and functionality to the LeapPad, the InnoTab is $20 less because it doesn't include the camera and video recorder functionality of the LeapPad. The device comes loaded with apps, games and books, and can connect online to the Vtech store to download additional content. The InnoTab also plays separate cartridge game ($25/each). This kiddie tablet is good, but we like the LeapPad's built-in camera functions. Also, the initial quality of software is better on the LeapPad than on the InnoTab. That said, this is still a nifty choice for kids.